Colombo was the first South Asian city to receive the prestigious accreditation as a ‘World Wetland Capital City’ in October of Last year at the RAMSAR Wetland Convention’s Conference of the Parties (COP -13) gathering in Dubai. In commemoration of the World Wetland Day on the 2nd of February, the Ministry of Megapolis and Western Development, and Sri Lanka Land Reclamation and Development Corporation together with the UNDP GEF Small Grants Programme Sri Lanka, CGIAR, The Field Ornithology Group of Sri Lanka, International Water Management Institute (IWMI), and Dilmah Conservation, bring you the ‘Colombo Wetland Fair’. The day-long event will celebrate Sri Lanka’s landmark achievement as one of the 7 pioneering countries to receive this international accreditation and provide the public with a fun-filled day out learning about fascinating and threatened wetland species and our role in protecting them. 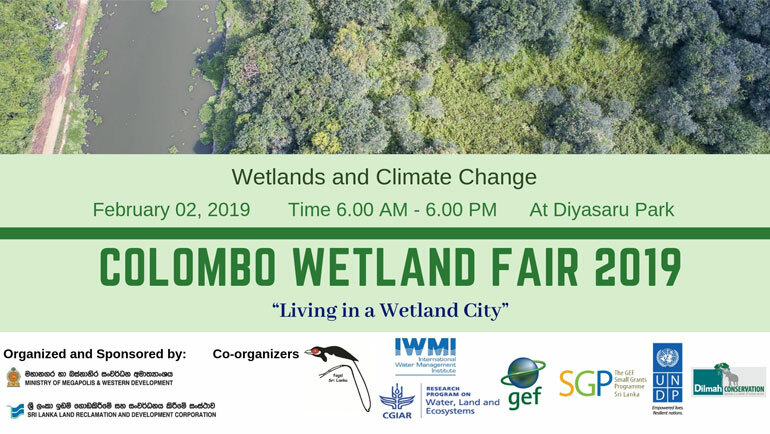 The fair will also teach people about the importance of wetlands in fighting the greatest environmental challenged of our time – climate change. Wetlands help us prepare for, cope with and bounce back from the impacts of climate change. We’ve already lost 35% of the world’s wetlands since 1970. Individuals, communities and governments must work together to protect these amazing ecosystems. Strategies that address climate change must include the wise use of wetlands. To learn more about wetlands and climate change click here. Events and attractions on the day will include guided bird watching tours, fishing cat field excursions, boat tours, market stalls and many more educational and child-friendly events. Some events may require pre-registration. For more details contact Chethika (0710521537) or Dhammi (0712411908).